My New Loves (yes, I am making this and the next point super vauge so I can give shoutouts to lots of things! )- I have fallen in love with so many new things this year: Dynasty, This Is Us and the Vampire Diaries for TV and Panic! at the Disco and Troye Sivan in music, both of which I really didn’t expect to enjoy as they’re quite different to most of my other favourite artists (I started listening to Panic! at the end of May and am now such a fangirl that they’re in my current top 3 artists, and consider Troye Sivan a top 5 fave despite the fact that I’ve been listening to him for just a WEEK at the time of writing this. Prepare for at least one post on his music come 2019!) . I also found a new favourite film in Love, Simon, a new Christmas staple in the Holiday Calendar and thoroughly enjoyed the new album from Shawn Mendes. The release of Staying at Tamara’s was one of the absolute highlights of my year, despite the day it was released itself being one of the worst days of 2018 for me too due to a particularly horrible hospital appointment. I could write (and kind of have written) an essay on the impact it had and still has, but to keep it short, it means so much more to me than I could ever out into words and I will always be grateful to it, especially Shotgun. Despite it being one of the most joyous songs in existence, I don’t think I have ever listened to it without bursting into tears, and I doubt I ever will now it links to such a specific memory for me. My Old Loves– As well as some new faves, there have also been some more long standing loves that have been a huge comfort. I’ve lost count of the amount of times I’ve watched Pretty in Pink or my favourite Disney films, I’ve spent many hours listening to Wanted on Voyage (I can’t believe this album turns 5 next year!) and my favourite Into the Ark performances and watching new seasons or revisiting old episodes of TV I already loved has often really taken my mind off things. 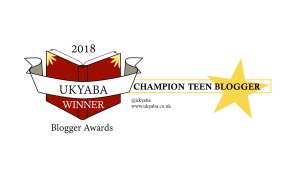 Winning a UKYABA– winning my Best Teen UKYABA has been such a highlight this year. I still can’t believe it; I genuinely couldn’t stop checking my emails for days after I won because I was so convinced there had been a miscount of votes. I can’t thank any authors or publishers who who voted for me enough, and all of my fellow bloggers who nominated me for Best Newcomer. Books– what else could the last item on my list have been but books? I have read so many incredible books this year, and I have escaped to over a hundred different worlds. I have been transported from the couch I am struggling to move off of because I feel so ill to a glitzy 1920s party, from a hospital waiting room to a magical Irish island and from a never-ending loop of worries in my mind to a roadtrip with a country music superstar, to name just a few (bonus points to anyone who guesses what those books are!). I don’t think I could ever express how much I love being able to immerse myself in someone else’s life and forget whatever is happening in mine for a bit, and I can’t wait to see which worlds I’ll find myself in next year. Sorry to hear it’s been a hard year in some ways for you, but glad you’ve had so many positives too! I’ll guess the island is Storm Keeper’s Island? The 20s party and country singer road trip have me stumped though?! If they’re MG give me clues, if they’re YA give me answers! I like this game. We should do a whole post of them – like a Christmas/New Year book quiz?! Oh yeah, definitely! I’ve never done a collaborstive type post before – that’d be fun! I never would have got those, though I do want to read A Sky Painted Gold! I’ll make sure I add it to my physical pile! And yes – how best to go about it do you think? !